You probably know that bananas are packed with essential vitamins and minerals, and they’re a great snack to fuel our bodies. So it seems like an easy choice to feed your pooch a banana. But can dogs eat bananas? Yes, they can! 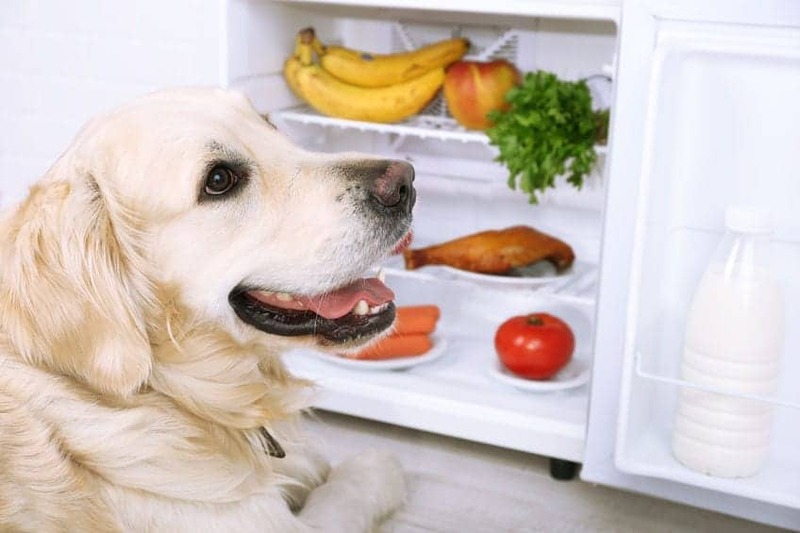 Thankfully, bananas are completely safe to feed to your dog. Many vets actually recommend feeding your dog bananas for the same reasons doctors recommend them to humans – they’re just downright healthy. They are especially great for dogs that struggle with diarrhea. To boot, most dogs love bananas because of their natural sugars. Bananas can be particularly wonderful for active pups. The natural sugars found in bananas are metabolized quickly, providing an instant flood of energy – which is also why humans eat them right before a workout.5 But if your dog isn’t active, that’s okay too. Bananas are still a wonderful energy booster. Overfeeding your dog bananas could lead to constipation, so make sure that you’re not going overboard with banana in their diet. As with humans, all fruits should be eaten in moderation because of their high sugar content. Bananas have three types sugars – glucose, fructose, and sucrose. They may all be “natural” sugars, but don’t forget that all sugar is natural – sugarcane is a plant, after all. Too much of any sugar could cause tummy upset, unstable blood sugar, and obesity. 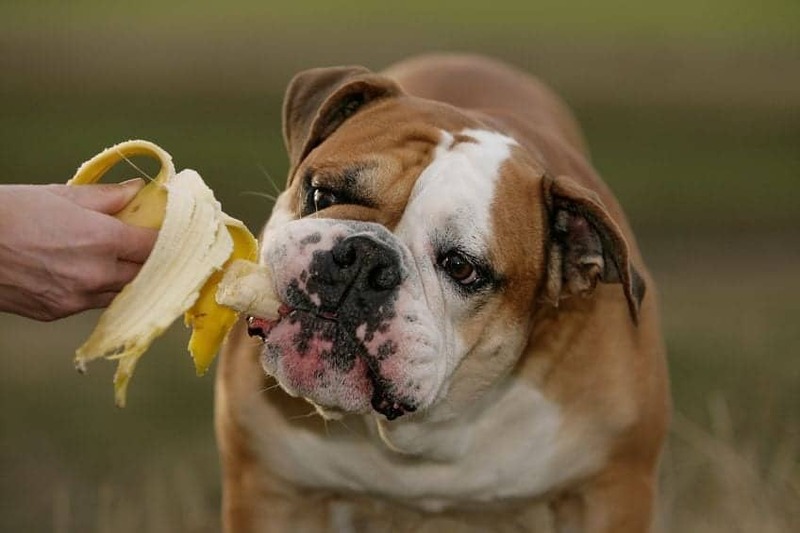 Some dogs may gain weight from eating too many bananas because of the high fat and sugar content. This is especially true for older, more sedentary pups. Though banana peels aren’t toxic to dogs, they are hard to digest and could cause a blockage, so keep those peels out of sight. Worried about a banana mess, or not sure how to best feed your pup bananas? Here’s a few different ways to treat your dog to a nice banana. If you’re particularly worried about soggy banana mess, freeze those banana slices before you give them to your dog. Mash a banana, and mix it in with your dog’s food. Mix mashed bananas with yogurt. Blend banana with a little peanut butter and freeze it in a fillable toy. Can My Puppy Eat Bananas? 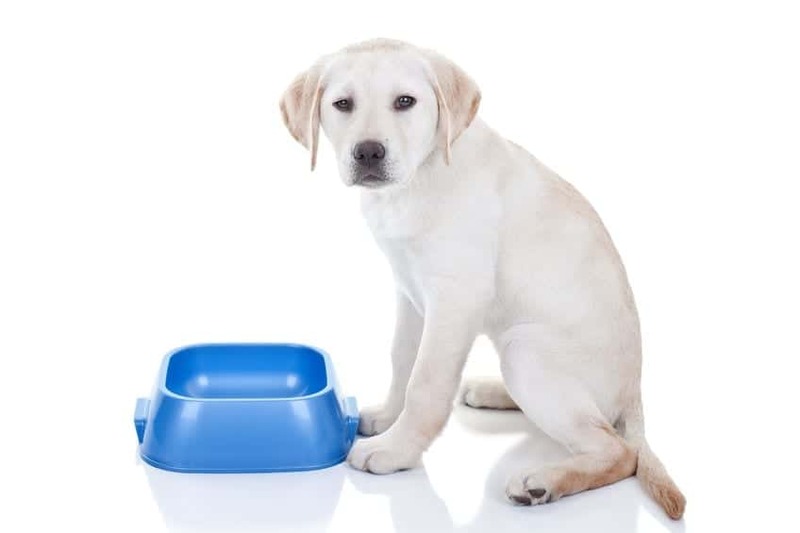 Small quantities of bananas can be fed safely to puppies.6 However, puppies are still growing, and have quite different nutritional needs compared to adult dogs. So it’s important to follow whatever puppy diet your vet has advised for you. If your pal has never had banana before, only give them a small piece at first. This is in case your pooch has any allergies to the fruit. One more thing – how great are bananas?! Can Dogs Eat Cranberries? Are Cranberries Safe for My Dog?